Grogan & Currid is NSAI Certified. NSAI Agrément introduced an independent Window Energy Performance (WEP) Certification scheme for the Irish consumer market. The WEP rating is provided for a standard window to represent typical window sizes and enables a comparison between different products. Each WEP rating label is specific to a unique window frame and glazing assembly from a single manufacturer. 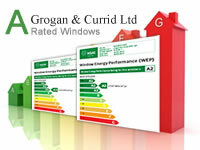 Grogan & Currid has 2 windows with this rating: 1 number with a 1.4 u value "A" rated and 1 number with an 0.8 u value (passive window) "A" rated. 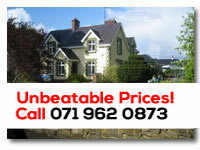 All Grogan & Currid windows and doors come with low "E" Gas Filled Glass units for extra insulation to your home. 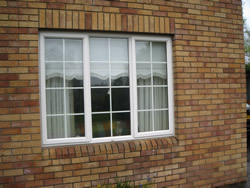 Low "E" Glass allows less heat to escape through your windows. This low E coating allows the sun's rays in and also reflects heat from fires and radiators back into your home, thus reducing your heating bill. 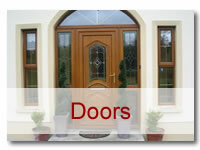 The look and feel of your windows and doors should naturally be as attractive as your home. 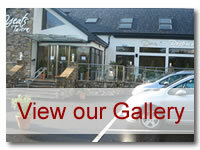 A wide choice of colours, styles and specifications are available depending on your particular tastes and requirements. The Vertical Sliding Window Period Elegance Coupled with Modern Technology. 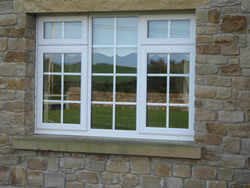 Choose from our range of high performance, standard or special traditional style windows. 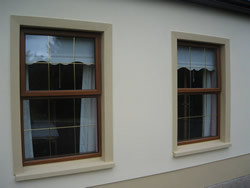 The vertical slider either operates in the normal sliding fashion or may be tilted in for easy safe cleaning. Choose from a range of colours to suit your home. In PVC, there are numerous colours including white, whitegrain, cream, oak, mahogany, bog oak, black, cedarwood, oregon pine, red, green and blue. 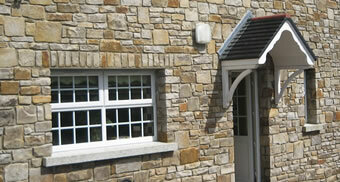 In aluminium, any RAL colour is available. 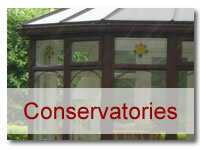 We can also provide mahogany, oak and teak colours. Our new aluminium system thermally efficient comes standard with 44m triple glaze glass and is 66m overall. 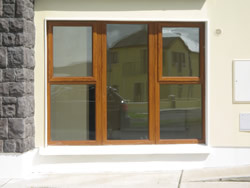 In timber, we can provide a range of stained finished or any RAL colour. 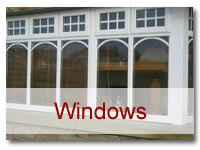 Why Use uPVC or Aluminium?